Has it really been nearly five years since Ian Doescher's Shakespeare's Star Wars series began? It was just one of those random, fun concepts that could have played out and died all in a moment, except that the combination works so naturally and he plays it out so well that . . . keep it coming. When you begin the eight book in a series like this, you kind of pause, like, okay, here we are again. And you're not exclaiming over all the verses and the references like you did the first time, except that that's what suddenly makes it all so wonderful. You're reading it at a regular pace, like a piece that simply flows. This language, elevated and poetic, fits the story perfectly. If there is anyone who had mixed feelings about character actions or motives in The Last Jedi, this is the perfect book to read. When I talked about The Force Doth Awaken, I mentioned how Ian was able to do less of a look into characters' heads than he'd done in previous books because for the first time he was going over a story where we only had one piece so far. He couldn't add extra bits about, for instance, Kylo's motives because we didn't really know all of his motives or all of his story yet. The same thing is happening here but to a lesser degree because, of course, there is much about the story that Episode VIII reveals. And even with what we don't know, he did such a beautiful job at expressing what we do know that it hid the fact that there may still be a little more to the story. Kylo's conflict. Rey's similar identity crisis. Luke's feelings of failure. Poe's reasons for going against Holdo and Holdo's reasons for doing things the way she did. As I've mentioned before, this series has moved on from being just a humor series. There are beautiful and genuinely moving passages in here. I particularly like the moment in which Kylo and Rey touch fingertips and also the moment when Kylo defeats Snoke. Does anyone truly think Kylo is weak; don't they see how much strength it would have taken to do the sneaky thing he did there? Wonderfully expressed. So, yes, may this series live on. Something a little bit different today. It's a chocolate product but not an edible chocolate product. It's a chocolate beauty product, the Dagoba Chocolate Mint Lip Balm. 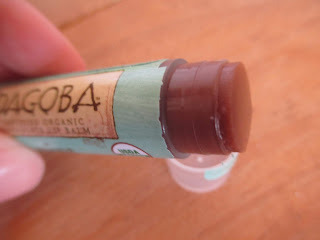 The thing is, even though it says Dagoba right in the center there, Dagoba makes chocolate not beauty products, so this lip balm is made by Eco Lips. The chocolate elements in the ingredients are cocoa butter, chocolate flavor, and cocoa powder. 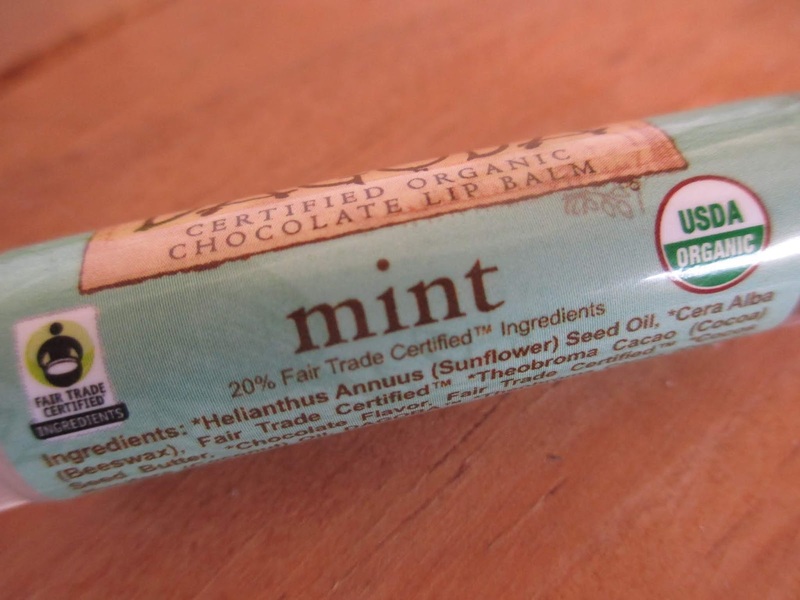 The cocoa butter of course makes a nice companion to the beeswax in a lip product. But the rest of it? A little weird--but perhaps there isn't any other way to make it. I don't know exactly what ingredient(s) "chocolate flavor" means, but the chocolate flavor that you taste when you use this lip balm is more of the contrived type of chocolate flavor than the flavor of biting into a piece of chocolate. That doesn't really make it worth it to me, though it might for you. My guess would be that the cocoa powder is there just to give the balm the brown color that will make our minds think of chocolate more than if this were simply a white balm. Honestly, though, the mint is probably stronger than the chocolate. You can almost forget that the chocolate is there but the mint will be present. Mint is kind of the go-to for lip products, isn't it? Now back to that brown color for a moment. Might you be wondering if it will tint your lips? Possibly, depending on your own natural coloring. The first time I put it on, I thought I could discern just a slight earthy tone as opposed to zero difference if I use a completely untinted lip balm (not that this one is meant to be tinted). So I suppose if you are very fair-skinned, you might get a little bit of darker color from this one. I don't expect that even then it would be too noticeable, though. It's a good lip balm, as far as lip balms go. I'm definitely for going more natural in beauty products: your skin absorbs things. And something you put on your lips? Well, that should definitely be something you would be willing to eat. So if you just need a lip balm, go for it. But if you're looking for a good angle on chocolate, well, I'd say that this isn't the most exciting option. As nice as it is to just wander a bookstore in search of something, something that you won't know until you find it, something that you won't find unless you go out wandering in search of it, there are always so many books that I already know about that I want to buy that it's difficult to work in the random finds, too. Still, I managed to sneak this one in. I remember that it was on a display table at Barnes & Noble, but I don't remember what the display was. Something akin to Staff Recommends, I think (not that, but something like that). I was drawn in by the cover. That cover is absolutely beautiful and absolutely me; I would buy that portrait and hang it on my wall. What else is great is that Lang Leav also did her own illustrations for the book, so you'll find a couple more images on the inside. Now, a cover is one thing and the inside can be another. This is a book of poetry and with poetry, well, it kind of just has to be your style. Either it is or it isn't. And it's usually easy with poetry to open up a book and read a random bit to get a sense of whether or not it's your style. I was so taken by Lang's style that I had to add this book to the ones already in my arms (the ones I'd planned to buy). Some books you just can't let out of your grasp. "My Heart" and "Patience" are some of the early poems. When I read them, they hit me like waves. I was stunned. When poetry delivers beauty and personal resonance all in one, it just . . . isn't something you can describe. I felt Lang's words shockingly deeply. Her style mingles poetry and prose. So every so often you'll come across a page or two of prose. "Patience," in fact, is prose. But it's all poetic prose and framed by verse, so it all combines. She writes in a style that's simple yet not stripped bare (which is a style that I don't tend to favor). Intensely emotional while also not sappy (though, granted, if you prefer not to read about emotions, well, then this won't be for you). Basically these are love poems, some of the high points and some of the low points. That, honestly, isn't really what I'm used to reading. Maybe because of that I feel like I should mention that these words could potentially open up some heartbreak for anyone who might be missing someone, either someone they've never had or someone they once had. At the same time, though, that's kind of the idea of fiction: fiction opens us up and tears us apart and stuffs us with emotions partly ours or ours not at all. The more emotions it stirs up in us, the better we claim it to be. Well. I suppose I'd better keep an eye out for more Lang Leav books (she has four more out; Lullabies was her second). I recently finished the junior novelization of The Last Jedi. It's worth reading both the regular and junior novelizations because they each include slightly different content, maybe different scenes or different looks into character motivation. This book made quite a point of showing the theme of failure--and then hinting at the connections between the different times of failures in the three plot lines of the story. Finn and Rose go off to try and disable the First Order's tracker so that the Resistance can escape. They try and they fail and nearly get killed. Poe tries to reroute the Resistance to his rule by leading a mutiny against Holdo; he finds out in the end that he was wrong to not trust that she had a plan and that his actions have in fact destroyed that plan and allowed the First Order to nearly wipe them all out. Luke is trying to escape his failure to teach Ben Solo to be a good little Jedi and Rey is trying to reach out to Kylo and bring Ben back. Luke realizes that he shouldn't have just tried to leave it all and Rey realizes that bringing Ben back isn't so simple as just giving him the offer. Everyone in this story fails. That's life; failure happens. Finn and Rose's adventure is obviously connected to Poe's because Poe tries to take control of the Resistance in order to follow the plan the trio has made apart from Holdo's plan. But Rey's adventure is connected, too. She seeks something (a great teacher and helper) that she does not find and she goes after something that she does not achieve (the redemption of Kylo Ren). Just the way that this junior novelization wrote everything out made me hear Rose's words about saving what we love versus killing what we hate in a new way. It made me think of everyone's attitudes towards Kylo/Ben. Luke and Leia have given up on him and don't think that he can be brought back. Rey thought that he could, only to find him still hanging on to his current path. But what if they're all going about it in the wrong way? Don't kill what you hate (Kylo Ren). Save what you love (Ben Solo). When Anakin Skywalker became Darth Vader, Anakin died and Vader took over. When Luke initiated Vader's redemption, Vader died and Anakin came back. What if the redemption of Kylo Ren happens differently? Kylo says that Ben Solo was his old identity. The identity of Kylo Ren he created for himself; it was his way of separating himself from who his parents and his uncle tried to make him. It was his way of saying, this is who I am. I'm not the son whose father won't spend time with him. I'm not the son who can never live up to his mother's reputation. I'm not the nephew whose uncle fears him. I am all powerful. I can, not I can't. So maybe, even though Kylo Ren is the representation of evil and wrong, just maybe there is something about his new identity that will linger. Ben Solo didn't feel comfortable trying to be Ben Solo. So he tried to be Kylo Ren and that only brought him more pain. Maybe he will find the happy medium. After all, isn't he supposed to be the one who is composed to equal parts of the dark and light sides of the Force? Kylo Ren won't become Ben Solo again. He will just accept that he is on the wrong path and readjust his path. Rey, in reaching out to him as he is, will say, I don't hate you, I care about you and I know you're better than this. We fail when we ignore the fact that we can be wrong. We achieve when we remember our weaknesses and move forward despite them. When I was in college, I had a subscription to Vogue. I enjoyed reading the magazine on weekends while eating scones. Then suddenly and without warning my interest went down to zero and I cancelled the subscription. I began to say that I liked style but had no interest in fashion. I can't even look at most magazines anymore. I don't just not like them; most of them even bother me. I do, however, like the catalogs from Anthropologie. I can't remember who it was, but I saw something recently that called their catalogs a fantasy--this person said that they imagined a faraway, exciting life where everything is perfect and that we like them just because we're trying to imagine ourselves living that false, impossible life. I disagree: I don't travel (at all--and I mind that I don't) (and there are other things that I don't have in common with the images) but I relate to those Anthropologie images more than to any others. That's why I like them, because I see me in them, not because I imagine myself to be someone else when I look at them. I was looking at an email from Modcloth last week and I realized something. Now, some of their images are similar in style to Anthropologie's. And this email had six pictures in it. Two of the pictures I really liked and two I didn't like much and two I mostly liked. I realized that in the two that I really liked, the models weren't looking at the camera. In the two I didn't like, the models were looking right at the camera. And in the other two pictures, the models were looking mainly at the camera but kind of off center, as if they were just looking in that direction but not quite right at you. And that was it. I like the images that are about a person and this person's identity, not about being seen. I don't care about being on trend because I have no personal interest in trends (I'm not saying that there is anything wrong with liking trends if you truly like following them and keeping up to date just for your own interest) and I don't need anyone to see that I'm on trend. In certain contexts, sure, you need to dress to look professional, presentable, authoritative, etc. But I'm not talking about that. I'm talking about just casual days of existence. And I'm not just talking about clothing. Often (more often nowadays, honestly) I don't even like the outfits in the Anthropologie catalogues. There are plenty of clothing items that I would never wear. But it isn't about that. It's that dreamy quality, of nature images and wood and stone and books. It's that imagining myself going about my day and my interests. I'm looking at me, not imagining someone else looking at me. I'm past the point of that direct-in-your-gaze look that says, here I am and this is who I am, what are you going to do about it? I have no rebellion in me. I'm too busy standing and being. I'm not trying to prove who I am to anyone; I'm just being who I am. I don't care if you don't see me, and I don't care if you don't realize who I am. None of that will change the fact of who I am. Kind of a mixed review today. Basically I'm just giving an overview of the things that I discovered last time I was at Black Butterfly in Prescott. The fact is, it's too hot right now to be carting chocolate around (unless you genuinely have a cooler in your car), so I would have needed to photograph and review these chocolates right away in order to do things properly. And, well, that isn't usually convenient. They were just such a wonderful bundle of chocolates, though, that I hate to give no note of them. While I have no pictures, I will say that while Black Butterfly always has such an exquisite, artistic style, everything in the store that day was even more gorgeous than usual. There were so many new things, too, which is why I couldn't resist getting maybe more than I should have. All of the colors and the paint work was all happy and classy at the same time. Gorgeous, gorgeous. From the case, I chose a Mint Meltaway and a Turtle. The mint was nice and creamy and light and not very strong on mint flavor, which was probably what made it more pleasing to me. The Turtle was one of those beautiful pieces that would make for a great gift--for someone of any age. Content-wise, it was a little closer to standard than I'd been expecting. The caramel, for instance, while certainly of much better flavor, is more of that standard sticky style. Pecans and chocolate are pecans and chocolate. The trio make for a good mix. One of the exciting new things in the shop are the Snack Bars. Basically they're upscale, candy bars. Clear boxes with long bars of chocolate painted (again) exquisitely. The concept makes them perfect for either eating right away (by yourself or with your group) or giving as a gift. The whole snack bar/candy bar thing also makes them more approachable for those who might be intimidated by a case of truffles. It took me a while to choose two flavors, but I went with the PB& J and Caramel Macchiato. I was trying to go for one more casual and one less casual. Possibly, though, I didn't choose the best flavors for me. I always bring this up when I talk about peanut butter chocolates, but I'm a bit of a hippie and I only like peanut butter that is made with just peanut and salt--no oil or anything like that. So that peanut butter taste that most people love . . . is a little too much for me. This chocolate leans more to that style and while the strawberry element is good, it's also a tad on the sweet side. I'm going to go, then, with that awkward statement that I think most people (to whom a PB&J bar sounds good) will enjoy this bar but it's a little too sweet and all for my weird tastes (it isn't as though I don't like sweetness--just not all sweetness). The Caramel Macchiato had little circles of caramel in it, of the same type that the Turtle had. It also had that coffee flavor that was in itself strong but made up a smaller percentage of the overall taste--like with a flavored coffee beverage like a caramel macchiato. It's dark chocolate, but only of 61% cocoa content, so still a sweeter sort of bar here, as would be expected from a line like this. So, fun new things to try out. The other fun thing is a new product Black Butterfly is carrying. Cacao Juice made by Repurposed Pod. Can I stress to you how amazing this product is? I'll try. First of all, I don't think I've really talked much about how great Tracy Taylor of Black Butterfly is. Not only does she make such beautiful chocolate, but she also is welcoming when you come in to the shop. She offers samples and tells you all about the products and how they're made, etc. Though I'd already had my chocolate sample when I came in, when I mentioned how excited I was about the cacao juice (because of course I was going to buy some no matter what), she got me a sample of that, too. So I had my first sip of cacao juice there in her shop. It's distinctive, certainly. As you can see, it has an off-white color, with a bit of yellow to it, like cream soda or something like that. It smells fruity, almost lemony. The taste, too, I want to describe as lemony, even though that obviously isn't exactly the flavor. Tracy mentioned that it's similar to lychee--and I thought, oh, yes, that's it. That . . . different yet approachable sort of flavor that has some tang to it but also sweetness. And that's what makes it maybe similar to drinking lemonade, after all: it has both a hint of a zing while also being sweet. And yet this is 100% cacao juice with nothing added to it, no sugar, no water, no nothing. So it's kind of amazing how complex the flavor is--but would we expect anything less from a cacao product? It feels similar, too, to drinking something like coconut water or aloe vera juice. Something that has a super distinctive flavor that is clear and crisp and clean and also strong yet not strong at the same time. What is cacao juice exactly, though, you ask? Well, you see, the folks at Repurposed Pod thought hey, cacao pulp is a by-product of the chocolate-making process. How would it be if chocolate farmers could get paid for that, too? With the growing efforts to give farmers a livable wage for their work, it's great to think that we can also be using more of their product. So the cacao juice is made from the pulp of the cacao pods after the beans/seeds are removed to make chocolate. They flash-pasteurize it right there and then high-pressure pasteurize it once it gets to the U.S. Each 8.75 ounce bottle takes six pods to make. And if you're paying attention to things of that sort, this juice is high in magnesium and B vitamins and antioxidants. Cacao is a fruit so why wouldn't it be healthy? You can add it to smoothies or make cocktails out of it (Repurposed Pod has a great list of cocktail recipes on their website) or whatever creative things you'd like. Myself, though? I think it tastes amazing as is. Granted, I do drink things like aloe vera juice (the 100% kind, not the weird diluted ones) on a daily basis, so you might want to try it yourself first before you order a case of it. I imagine, though, that even if it's the type of thing some people might find odd-tasting at first, it's also the type that your palate will quickly adjust to. So I could completely see this product taking off as the next big thing. It tastes amazing and it has great potential for health marketing and sustainable marketing and fair trade marketing and coolness marketing. It's pretty much the best thing ever. I recently bought a new copy of Jane Eyre. I . . . didn't need a new copy of this book. While it was pretty, it also wasn't my favorite copy of this book I've ever seen. It's just that I can never resist buying all the copies of Jane Eyre. While, from the standpoint of a literary critic, I will certainly listen to, even in theory agree with, anyone who states that Jane Eyre isn't Charlotte Bronte's best novel or the best novel of the Victorian era or the best of the Bronte Sisters' novels (although it's kind of unfair of us to lump the sisters into one category as if they had no individuality). But the thing is (and I know many people agree with me), Jane Eyre is one of my favorite books and maybe even my favorite of all. Jane Eyre is my soul. I reflect back and forth with that book like it's a mirror that I look into or a lesson book written just for me. I started reading it first when I was ten; it was a little too much for me at that age so I picked it up again when I was twelve (I finished it the summer just before I turned thirteen). Since then, I've read it again every few years. It grows with me and develops with me. It's my soul. I only ever read the first copy that I bought all those years ago in the children's section at Barnes & Noble; this was the Puffin Classics edition with Jane walking in a billowing purple dress outside of Thornfield. But I also own the Penguin edition, the Barnes & Noble classics hardcover (I'm missing their paperback, am I not? ), the Barnes & Noble collectible classics hardcover (they now make this one in a soft cover instead, so I'm glad I bought it when I was still in this nicer version), the pretty Penguin Classics edition that places like Anthropologie loved to sell a couple years ago when they first came out, an old clothbound blue copy that once belonged to a random high school library in Arizona, a dark blue clothbound copy possibly even older than that one, the Knickerbocker Classics edition (which is the one I just bought), the Canterbury Classics edition, Dame Darcy's illustrated edition, the graphic novel version, and the BabyLit version. If you count those last two (which are technically in a different category, that's twelve total. And I suppose I do also own one of those book journals that uses the sentences of the book (printed in tiny, tiny letters) instead of lines for you to write on. That would make it a baker's dozen. For a book that's this important to me, I might as well have a little collection going. I mean, it isn't as if there is much book merch out there, even for a book as eternally popular as Jane Eyre. Sure, I have that journal and the t-shirt from Out of Print and especially nowadays with things like Etsy, there are certainly some options out there. But mainly the books are my merch. I can just sit and look at them and consider how they do or don't reflect on the content and tone of the book. That gray leather-bound is wonderful and Dame Darcy's is pretty cool. But, you know what? I think that perhaps my favorite is still that purple Puffin one. Some of the stylish, trendy copies automatically make this book look all feminine with pink and yellow and flowers and frills because it's a book about a woman written by a woman. And yes, it is certainly a feminine book in many ways. But it's also a dark book--which is why I love it. This purple book captures that duality. Jane is there in her dress but you can also see all the storm clouds around Thornfield and the birds circling the air like a bad omen and the light shining on the trees to represent all the nature elements that are also so prevalent in this book. Yes, this is the cover that made me reach for this book to learn more--all those years ago when I had never heard of Charlotte Bronte or Jane Eyre. The idea of Christopher Robin sounded much like Hook, right? The adult has outgrown the fantasy of childhood and has to relearn it all in order to reconnect with his children. But if Hook was something that adults in particular could relate to, Christopher Robin is even more so. The beginning scenes make for a touching short film in and of themselves. The boy who knows that he's growing up and will soon have other things to replace his childhood play. The boy who becomes the child in grief, the young man who has to handle "so much more than he should." The person who has to go to war and face all of the horrors therein. The man who has to return from the war and approach the new battlefield of the work force to provide for his family. The person who is so tired out from all of this that he can't even take a free moment to remember what joy and happiness are; he's just so busy trying to handle responsibility. What makes all of this so touching is that step by step montage. With something like Hook, you have the parent who values their career as if it matters more than their family. You see it often in film (Jungle 2 Jungle is coming to mind, too, for some reason--ah, 90's films). Then they get the reminder that they need to remember that it's their family that should come first. But with Christopher Robin, you know that this character does love and care for his family--it's that love and care that let him come back half sane from the blackness of war and that drives him to spend so much time on work so that he can make things better for his wife and daughter. It's so touching because we've all seen it in real life. People who work full time don't have much time to spend at home--and yet you have to work full time or even overtime to provide for a family. So the film isn't saying that Christopher was in the wrong and needed to learn a lesson; it's saying that life is hard. As far as the fantasy world goes, basically this film made the Hundred Acre Wood into Narnia. It's a little different from what you get when you are simply looking at stories of Christopher as a boy. There, this fantasy place is his created world, in a way his practice place for the real world; it is inevitably, by its very nature, the place of childhood that he will leave when he reaches adulthood. Narnia, on the other hand, is the place that you continue to believe in even when you grow up, even if you no longer visit it as an adult. Narnia fans will remember that Peter, Edmund, and Lucy would get together with Professor Kirke, Polly, Eustace, and Jill to talk about Narnia--but Susan, once she grew up, no longer believed in Narnia and considered it simply an old childhood game, nothing of importance. So that's kind of the same thing that this film did with Christopher Robin's Hundred Acre Wood. This wood became a place that it was important to still remember and stay in touch with. Robin doesn't just stop visiting Pooh and Piglet and the rest; he also puts away his drawings of them and discourages his daughter from looking at the pictures, instead of telling her about the fun games he used to play as a boy and letting the games live on with her. Because life took away his spark of fun, he isn't feeding that spark to his daughter. The Hundred Acre Wood shifted from being a representation of childhood to being the element of play, the element of fun that needs to remain part of life even when you have to add necessary things like responsibility to it. Apparently Theo doesn't want me to eat this chocolate of theirs: they have labeled this line Kids' Crunch. The flavor I have (against, perhaps, the will of Theo) is the Banana Milk Chocolate. 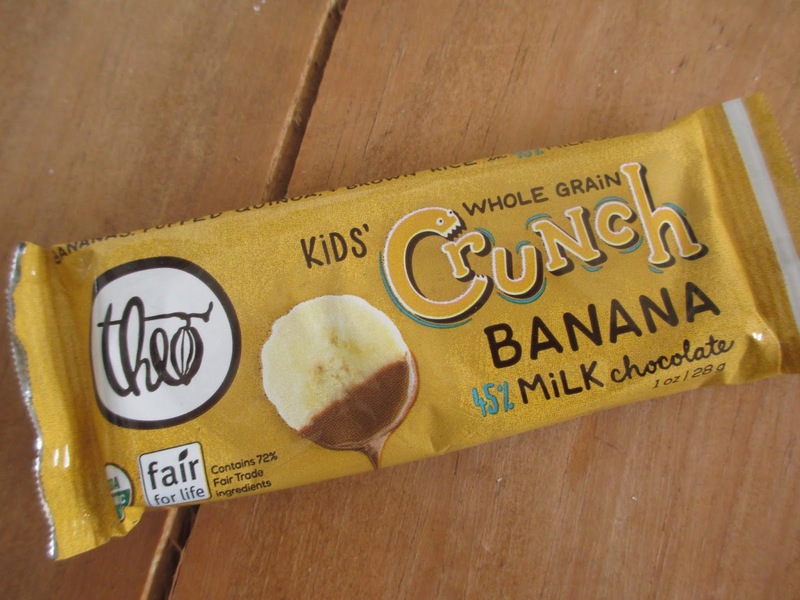 I love for brands like Theo to come out with casual and/or candy chocolate like this--I just don't know that it had to be labeled as for kids in order for that tone to come across. Sure, though, the name instantly tells you that it's candy and that it's something you can put in your kids' lunch boxes and that it's not just a sweet treat but also an alternative to other products like Hostess Cupcakes or, more specifically, Nestle Crunch bars. You'll notice the "whole grain" bit in the name, too, that tries to say, hey, this is "healthy," too. And like with the Peanut Butter Cup from Unreal, there is puffed quinoa in here in addition to the puffed brown rice. I still don't see the point; I still see this simply as a way to look trendy (which probably works, so much as I might roll my eyes at it it's probably a smart move). The packaging doesn't really have much of a kids' specific design style, except for the voracious letter "C." The bar itself is very plain, smooth on one side with the crisped rice visible on the other side. It's almost too basic of a look, except that that's kind of the idea. The aroma? Darker milk chocolate, since this is Theo's 45% milk chocolate, which is definitely darker than the average milk chocolate, especially in terms of candy (I see nothing wrong with the syntax of that sentence). Start nibbling in and you'll get the crisped rice and the banana and the chocolate. Pretty straightforward. The crisped rice and quinoa add the same familiar texture of a Crunch bar. The bananas are freeze-dried (as opposed to the banana chips in the Black Butterfly toffee), so they do taste like banana. Banana isn't, after all, one of those flavors that you can fake. I always remark on the rarity of banana in chocolate products, but it does seem like it's showing up more often now than it did a few years ago. That must be to please me, right? I wonder (and kind of hate to wonder) if the 45% milk chocolate might be a little too dark for a bar labeled as being for kids. You never want to put too much past the palates of the young ones, but they do tend to prefer sweeter things. Still, though, this chocolate should be sweet enough--and anyway, I know I won't be the only one to ignore the label. Adults want chocolate candy, too, you know, and many of us will be glad for a more substantial milk chocolate. The short of it: I like this product but I don't like that its label says it isn't meant for me. I never felt caught up in the whole "shop indie bookstores thing." I mean, I'm all for local, but I'm also for, well, local that makes sense. For instance, local clothing stores that sell cheap, fast fashion clothing don't make sense to me; I'd rather shop at a chain store and get good quality clothing that'll last me for years. This is a completely irrelevant analogy for bookstores; basically I'm just trying to say that I don't want to say something. I want to do something. I don't want to say, oh, yes, everyone, support your local bookstore when I know I'm just going to buy majority of my books from Barnes & Noble. I've always liked Barnes & Noble. Back when it was Borders and Barnes & Noble, I preferred the latter because of the earthier, more Old World design versus the modern look of the former. Barnes & Noble has a wide selection, not quite every book on earth, sure, but as many as they can fit on their shelves. They always give good service, too, whether it's just in ringing me up or in helping me find something. If there's a book I want to buy on the day it comes out, I know they'll have it on the day it comes out. Now people are starting to say, it doesn't matter if it's local or a chain, just support bookstores in general. Isn't that what I was saying all along? Sure, indie bookstores are great; I'm not debating that. Changing Hands is the famous one in the Phoenix area. But I don't live super close to either of their locations, so quite frankly Barnes & Noble is more convenient for me to go to on a regular basis. Bright Side Bookshop in Flagstaff is cool, too. Places like this you might be able to get more local-centered titles, or even great non-book items like shirts and other merch from Out of Print. Cards and notebooks, too. But I tend to go to indie bookstores more like I go to cute stores like The Hummingbird House in Sedona (which sells decor, perfume, jewelry, a few antiques, etc.) I go to some used book places, too, sometimes. And I buy a decent amount of books at museums and places like that. I go to Barnes & Noble, as I mentioned, for the bulk of my books, though. New books, like Star Wars books. Classics that I've decided I finally want to read. Books that I discover just from browsing. And chain or no chain, I like shopping there. Because bookstores are great.